Are your kids begging for new outdoor toys? Are you looking for some outdoor fun for the whole family to enjoy? 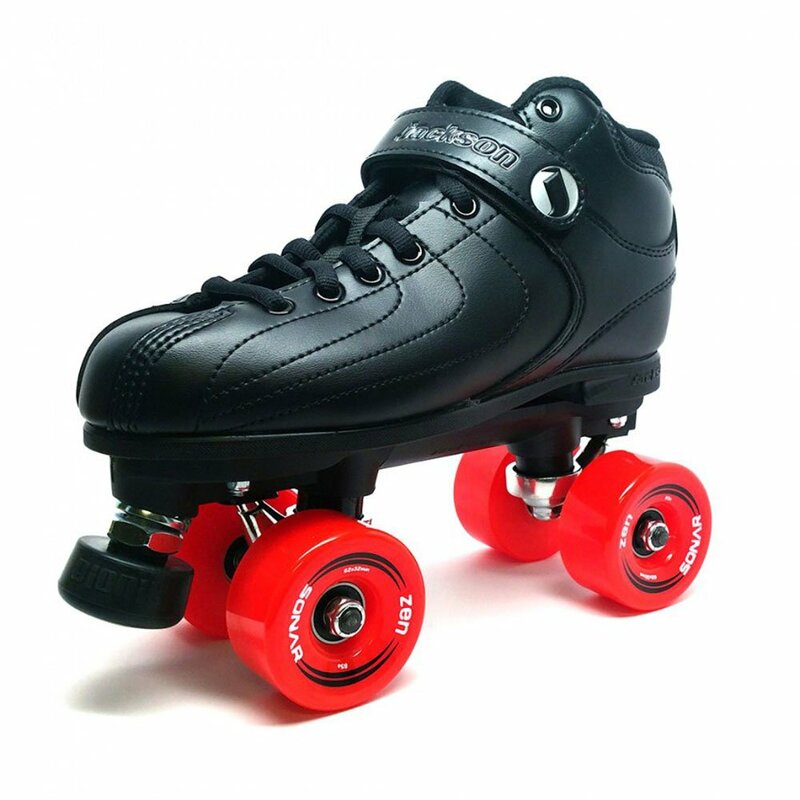 If this sounds like your house roller skates are a great option as they are a safe and fun option that children and adults can enjoy. The key to this is buying the best roller skates for kids, so they can be both comfortable and confident while skating and that includes learning to skate. Despite how many different skates there is to choose from there are only two types of skates. When purchasing skates you must decide between quad and inline skates. What you need to do is learn the difference between the two so you can select the right type for your child. *Quad Skates – these are the skates you might remember from your own childhood. Quad skates have four wheels, two in front and two in back. The way the wheels are set up provide better balance making them a better choice for beginning skaters. *Inline Skates – these are also referred to as “rollerblades.” Inline skates feature four to five wheels that are perfectly lined up. Inline skates can be difficult to use as they require a lot of leg and ankle strength. 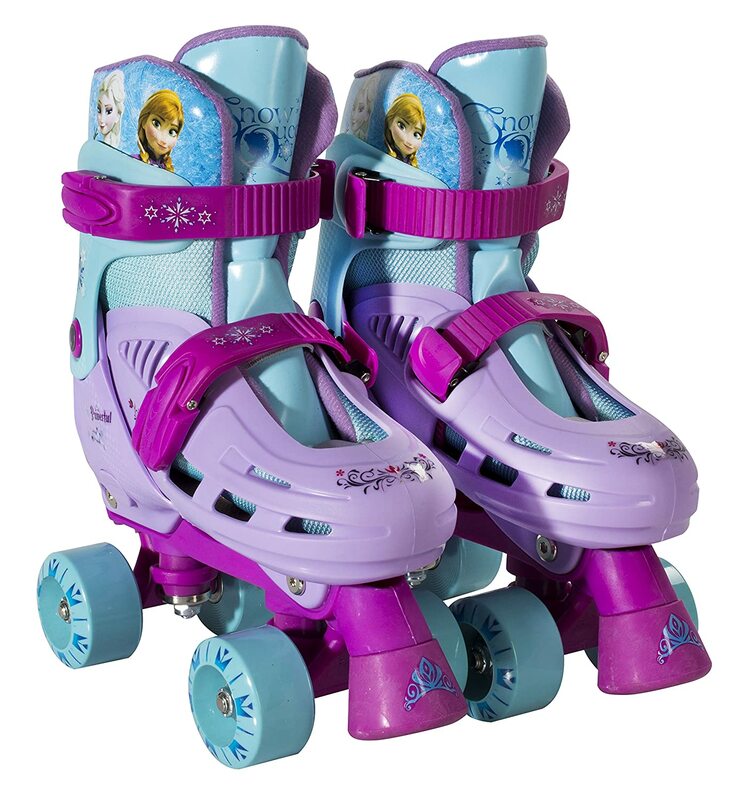 These skates are strongly recommended for children who are already comfortable on quad skates, as they require a lot of coordination. 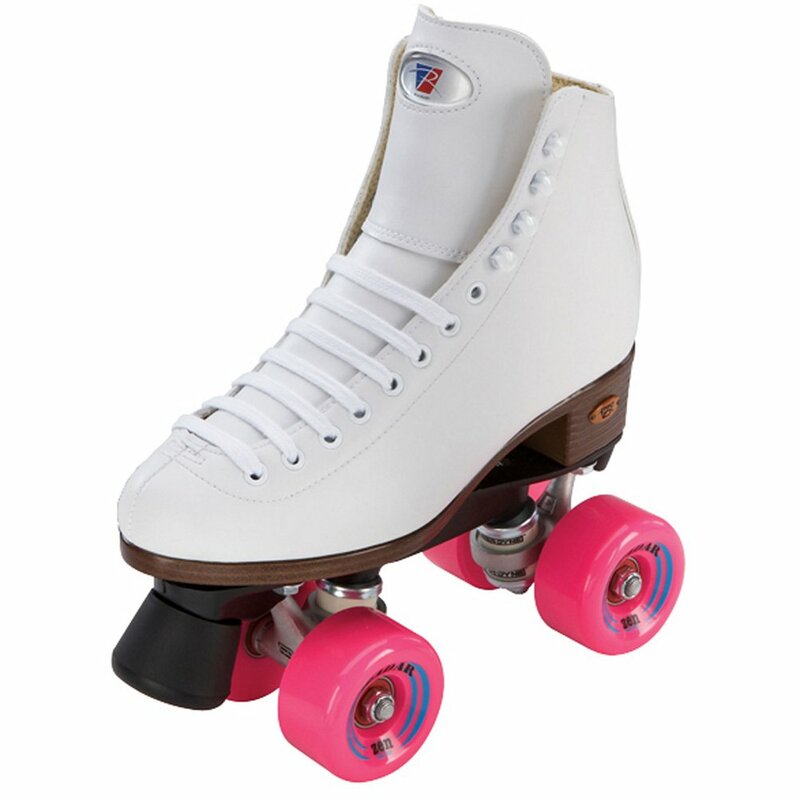 These quad style skates are an excellent throwback to the original design with the white vinyl high top boot. The high-quality boot is attached to the base plate and offers a fully adjustable truck. The wheels are made from high-grade urethane and offer a wide wheelbase for stability. The semi-precision ball bearings offer the smoothest ride possible. 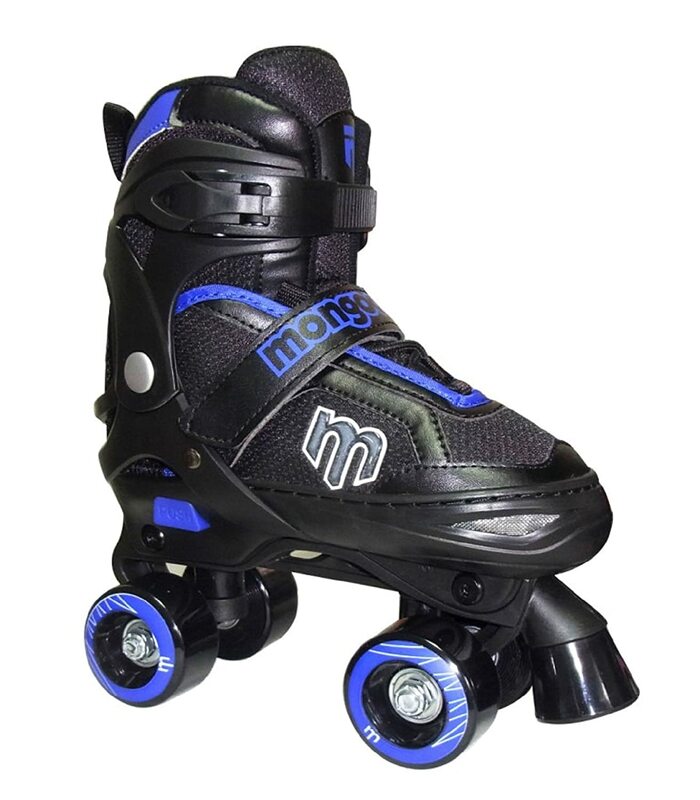 One of the great things about these quad style skates is the unique color combination with the stylish design. The silver-grey wheels are connected to a black base plate. 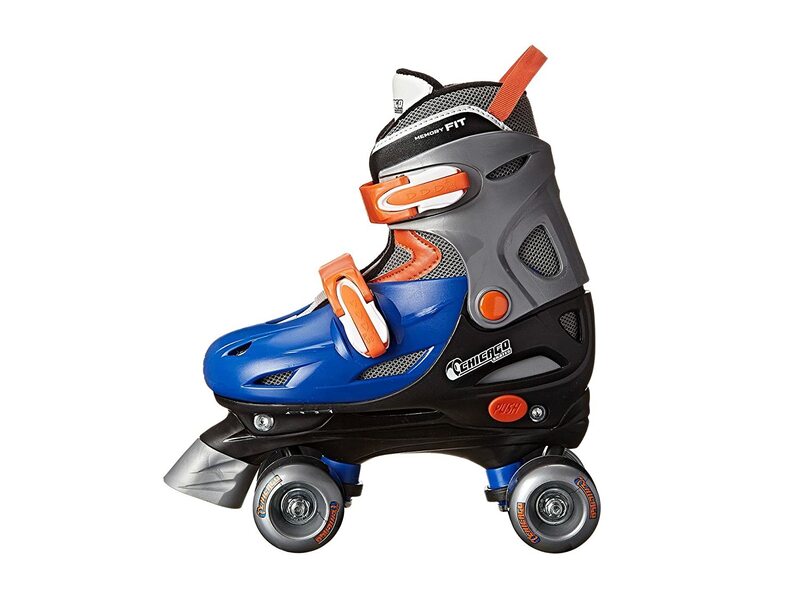 The mainly blue boot shell features a silver grey ankle support that matches the wheels, plus the orange and white accents allow the skate to really stand out. 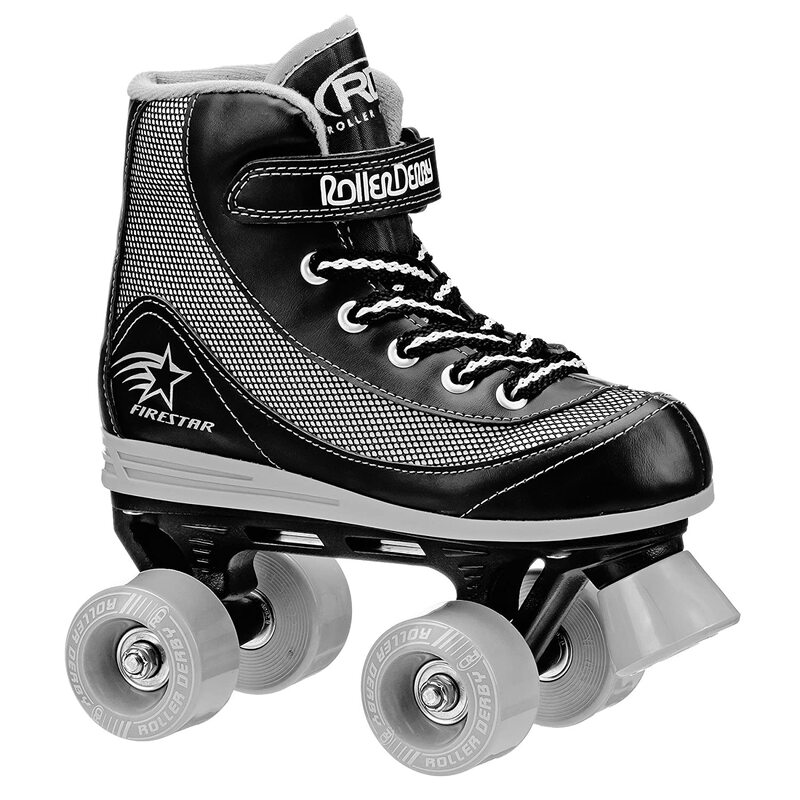 The skates have the ability to be adjusted two ways for comfort and precision ball bearings offer a smooth ride. 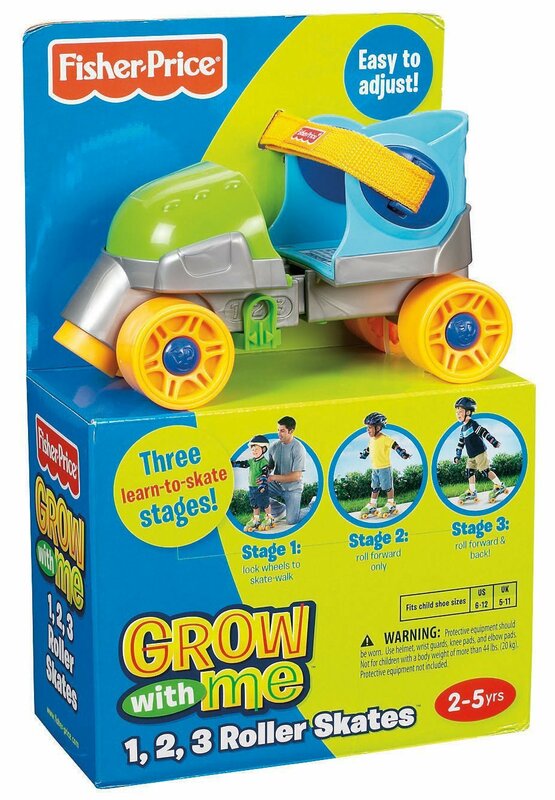 If you have young children who are just learning how to skate these Green Grow with Me Skates are the ideal choice. These skates allow your child to build confidence as they learn how to skate as the skates allow them to master one skill before moving onto to the next. The skates can have one wheel locked, wheels moving forward only, or free rolling. The extra space in the back wheels adds to the stability. These quad style skates get their unique name from the fact they are made from a bunch of high-end parts that all come from different manufacturers. The boot is a Jackson Vibe boot and is classified as a low cut speed boot and is great for beginners. Attached to the boot is a Jackson basic plate with Bionic XS toe stops. The Radar Zen outdoor wheels come with Bionic Abec-7 bearings giving you a smooth ride outside or in the rink. If you are looking for an all-around skate that kids of various ages can enjoy the Riedell Citizen makes an excellent choice, plus it can be used for indoor or outdoor fun. The high boot is made from soft, synthetic materials but offers plenty of ankle support. The nylon plate comes complete with a bolt-on bell stop. Riedell Radar Zen Wheels are paired with Riedell Kwik ABEC-5 bearings to offer a smooth and quiet ride. One of the most outstanding features of the Chicago Boys Sidewalk Skate is the wheels. They are bigger than what you usually find on skates; the extra surface area adds to the stability and traction of the skate. The semi-precision bearings allow for a smooth ride on any surface. The mid-level boot is secured to the foot with a pair of high-quality laces and a Velcro strap for added snugness. 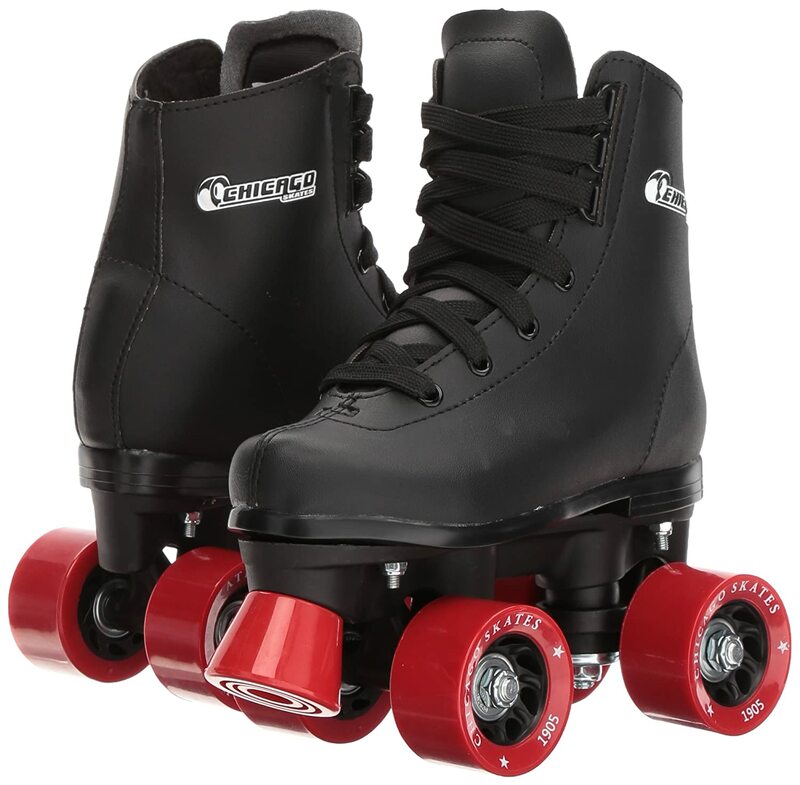 The Mongoose Adjustable Quad Roller Skate is a popular choice as it offers something other than a white boot. The colors and design provide a sporty look while also being fully functional. The high boot offers an easy strap mechanism for securing the boot to the ankle. The skate’s toes are designed to provide extra protection. The skates are adjustable up to a size 4, so they really do grow with your child. The urethane wheels and professional-grade wheel bearings provide a smooth ride across a variety of surfaces. 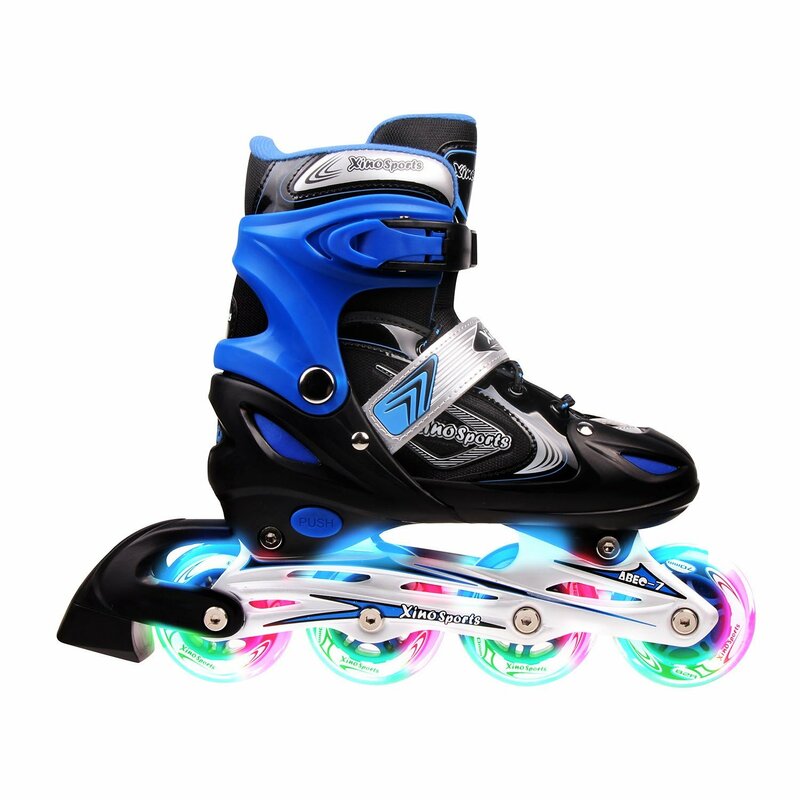 Kids will love the fact that the front wheel of the XinoSports’ Adjustable Inline Skates light up as they skate. The front wheel comes with built-in LED lights in red, green, and blue. The wheels use ABEC-7, a high-performance bearing, to offer smooth rides over different surfaces. The aluminum frame is integrated into the boot and wheels to provide additional support. The extra layer of support padding in the ankle area allows for a comfortable fit. The adjustable sizing option allows the skate to grow with your child. 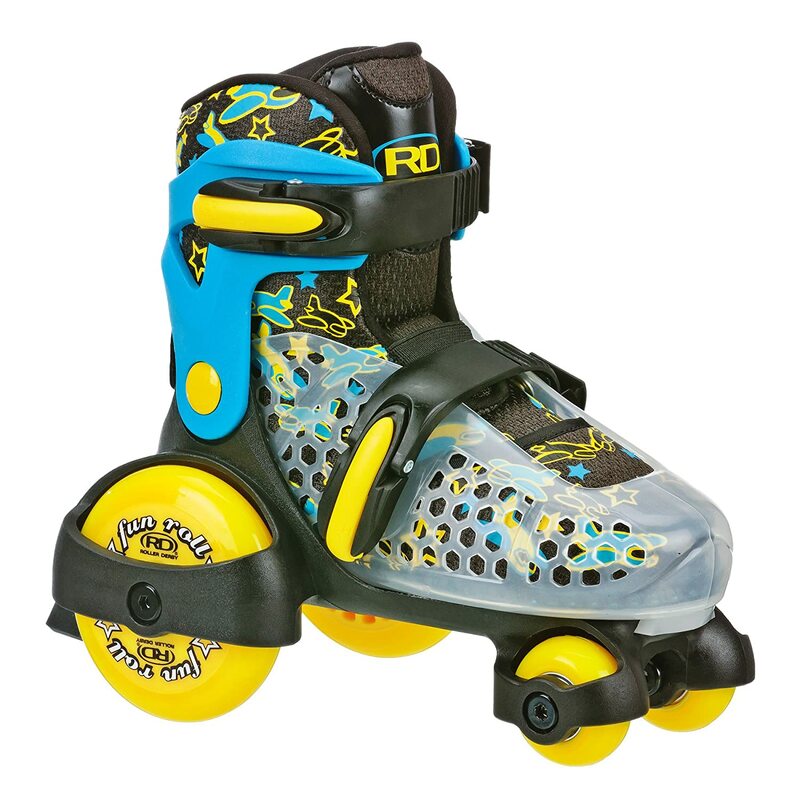 The Roller Derby Boy’s Fun Roll Adjustable Roller Skate is designed for kids as young as three years old. The skate can be adjusted in size to grow with your child. The design of the skate is focused on stability and balance. The rear wheels are larger than what you find on other skates are attached to the side of the boot frame to really widen up the wheelbase. 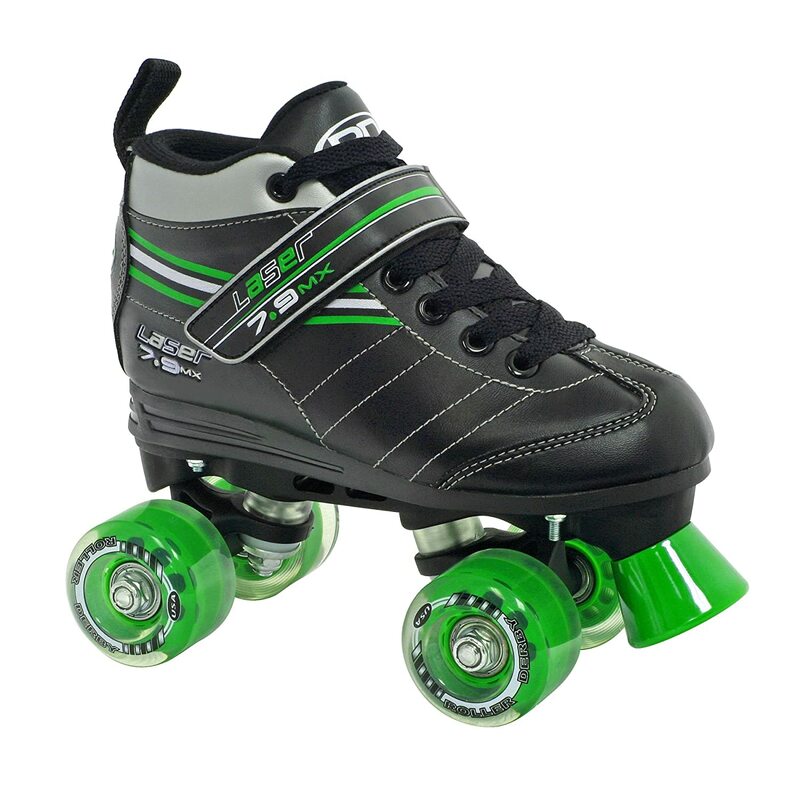 The skate also offers a comfortable inner lining, locking buckles, and a molded ankle support system. The Tracer Adjustable Inline Skate doesn’t just offer a beautiful design; the skates also offer style and comfort for your skater. These skates are highly durable and will stand up over the course of time, no matter how many falls they may take in the beginning. The skates are ideal for beginners as they can be adjusted to fit growing feet. The urethane wheels are attached to a nylon polymer frame that has been fitted with an adjustable molded shell. Inner pads provide the comfort kids need without interfering with how easy the skate is to put on or take off. The skate is offered in a girls and boys design. The Firestar Roller Skate may not be fully adjustable, but it is an amazing roller skate for all kids. The thick and durable laces combine with Velcro straps to provide a snug fit that you or your child has complete control over. The better the fit the more stability to the high boot will provide. The padding inside the boot is on the thicker side, it is nowhere near as thin as you see on other skates. 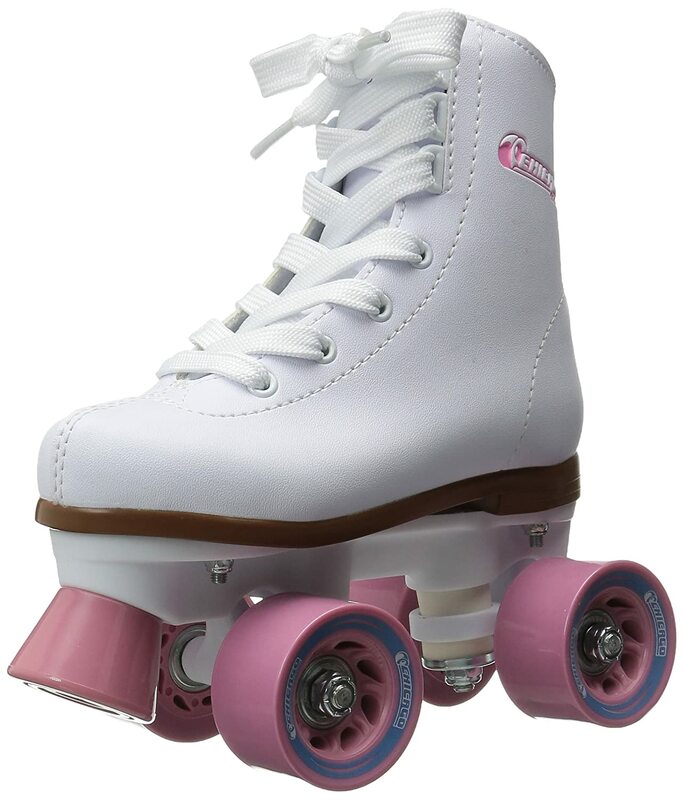 The thicker padding provides a comfortable fit that can aid in hours of inside or outside roller skating. We already mentioned the girl’s version, so it is only fair that we include the boy’s version on this list. 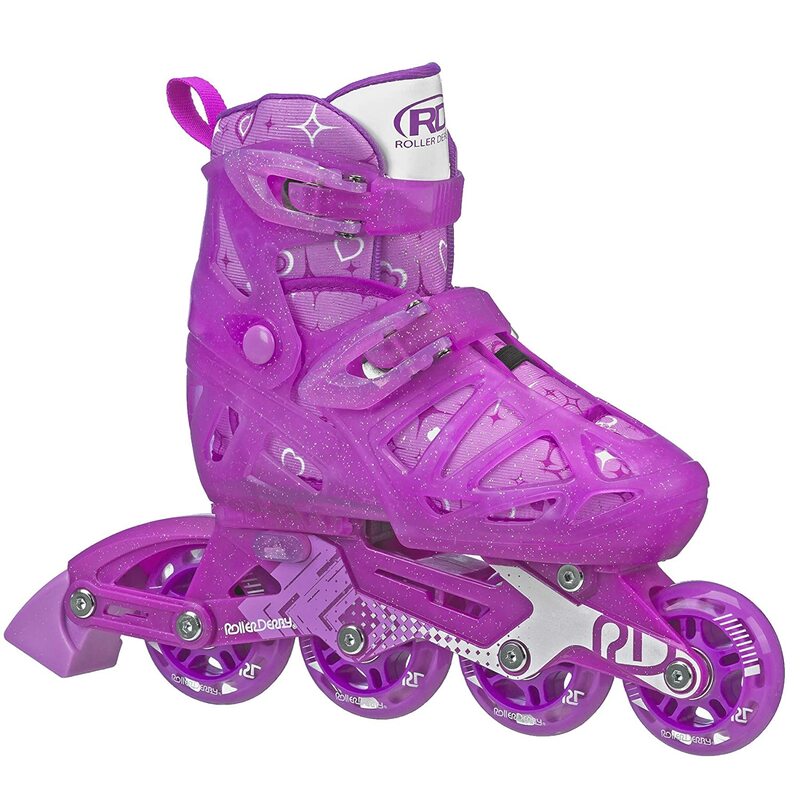 These skates are easy to put on and even though they are designed with beginners in mind they offer a sturdiness that all experiences will enjoy. The urethane wheels are on a wide wheelbase to offer stability with a smooth ride. The vinyl high top boot laces up to provide firm ankle support with a quality skate. One of the most talked about features of the Laser Speed Quad Skate is the fact that is designed to look like a tennis shoe. The benefit to this design is with the excellent padding the skate is very comfortable to wear. The skate uses both laces and Velcro straps for a secure and snug fit that you or your child have total control over. The wheels offer a laser illusion to help your child feel like they are putting on a show. The wheelbase is ideal for providing balance to give your child the confidence they need while learning how to skate. When it comes to character designed skates the Frozen Kids Classic Quad Skate is one of the best around. The design and color choices are all focused on the movie, while both Princesses make an appearance on the ankle support. The toe stops (one comes on each skate) and straps feature snowflake designs. The auto-adjust system is one of the easiest ones to use in quad skates and allows for you to adjust the size from 1 to 4. Made from polymer plastic and solid PVC the boot is impact resistant. 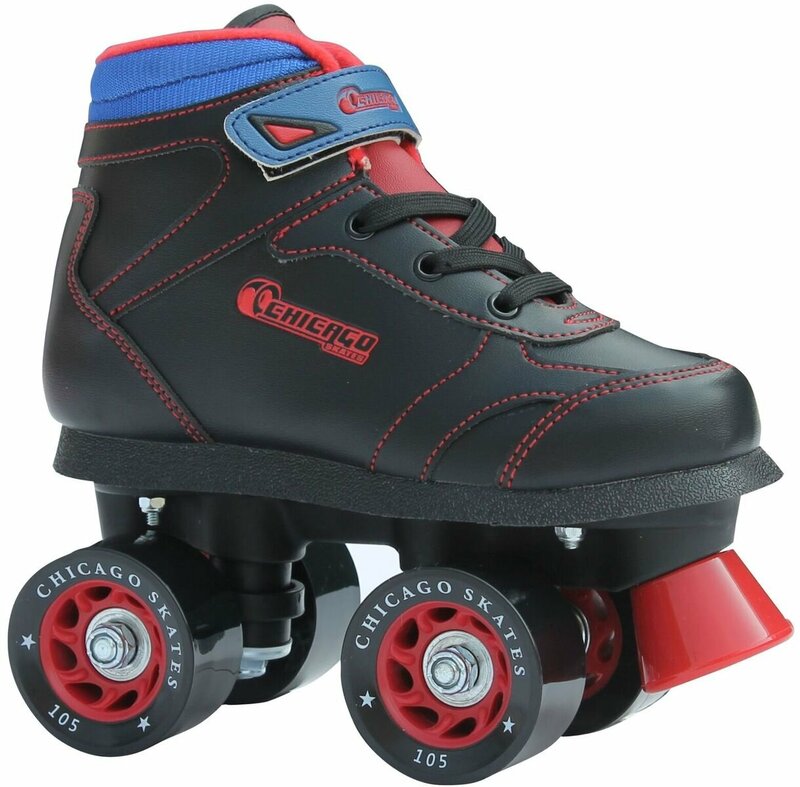 The solid PVC wheels don’t roll as smoothly as urethane wheels, which is nice for young skaters. 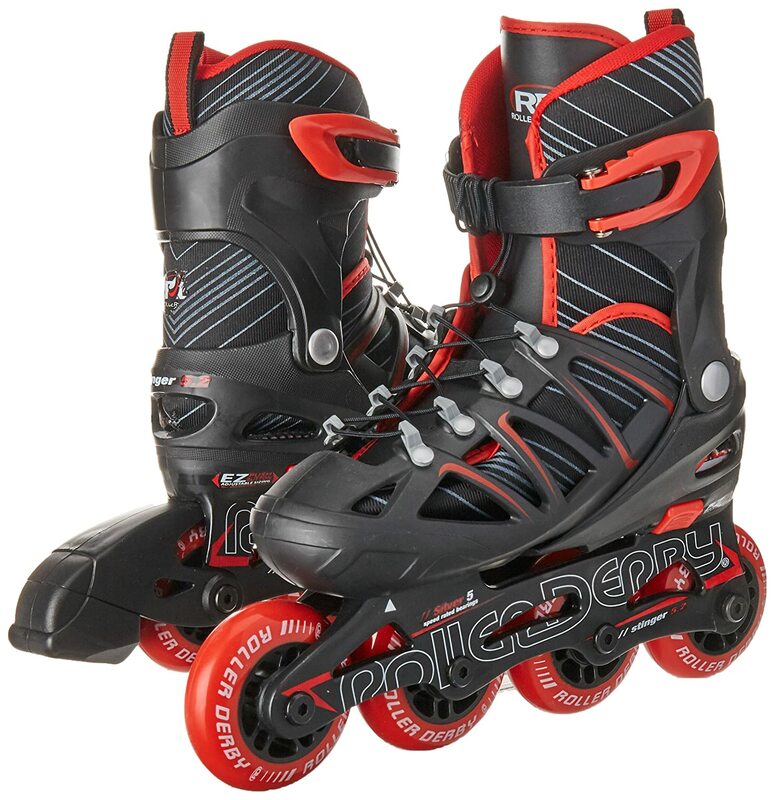 The Roller Derby Boy’s Stinger 5.2 Adjustable Inline Skate offers powerful construction and a unique design that is perfect for kids just starting out. The laces use a pull and tighten system that allows your child to easily fit the laces to the appropriateness snugness. The top strap provides additional ankle support in the high top style boot. An adjustable sizing push button allows you to adjust the length of the skate as your child’s foot grows. The polyurethane wheels are paired with silver speed bearings. A back brake is located on one of the skates and may take some getting used to.